President Park Geun-hye on Friday tapped judge Hwang Chan-hyun and Korea Development Institute researcher Moon Hyung-pyo to head the Board of Audit and Inspection, and the Ministry of Health and Welfare, respectively. Hwang and Moon will need to undergo parliamentary hearings before taking office. In addition, chief of Hanyang University’s College of Performing Arts and Sport Kim Chong was named Deputy Minister of Culture, Sports and Tourism. Hwang, the chief of the Seoul Central District Court and head of Seoul city’s election watchdog, will fill the post that has stood empty since August. In August, former BAI chief Yang Kun stepped down amid allegations of interference and pressure to step down from the Park Geun-hye administration. Hwang, who has served for more than three decades, spent most of his career in criminal court and presided over some of the biggest cases including that of the serial killer Yoo Young-chul and the illegal presidential campaign fundraising in the 2002 election. The seat of the welfare minister, meanwhile, has been left vacant since the resignation of Chin Young on Sept. 30 citing fissures with Cheong Wa Dae over the move to link Park’s basic pension fund with the national pension. Moon, considered one of the nation’s top experts on public pensions, is set to pick up where Chin left off. Cheong Wa Dae pinned hopes on Moon to clear up the public debate on the pension system. Moon is a former member of the Grand National Party’s public pension task force that then-party chief Park Geun-hye established, and is thus expected to be familiar with her pension policy plans. The GNP is the forerunner to the ruling Saenuri Party. The former Cheong Wa Dae official and Yonsei University graduate was serving as one of the chief economists at the Korea Development Institute before being appointed to head the ministry. The main opposition Democratic Party immediately criticized the choices, saying that a judge heading the BAI, which comes directly under the presidential office, could damage the independence of the judiciary. As for Moon, the DP focused on the scaling back of welfare pledges. “(Moon) led research on pension and welfare budget, and his selection appears to reflect Park Geun-hye administration’s intention to scale back welfare pledges using a lack of funding as an excuse,” DP spokeswoman Rep. Lee Un-ju said. Although the Park administration is moving towards operating with a full deck of card with Friday’s nominations, the growing controversy over last year’s presidential election remains. What started as allegations of election meddling by the National Intelligence Service has escalated into accusations of denying the Constitution, and the outcome of the election. However, the president has yet to speak a word about the issue, while the presidential office maintains that all related developments occurred under the previous administration without the president’s knowledge. Her silence, which has worked in her favor before in moving past issues such as controversial personnel management, does not only appear to be losing its efficacy but also fueling the situation. With Park appearing to ignore the issue, the main opposition Democratic Party, including its former presidential candidate Rep. Moon Jae-in, has repeatedly called on Park to apologize and take steps to resolve the situation. 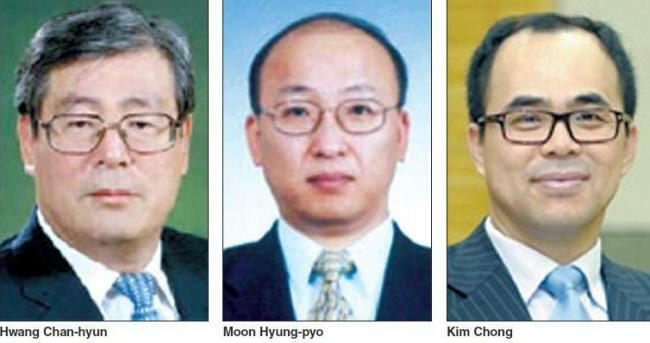 “The president’s silence is making the state of affairs worse each day,” DP chairman Rep. Kim Han-gil said on Friday. Saying that the DP had no intention of raising the issue of a re-election, Kim urged Park to punish those involved. As for the ruling Saenuri Party, the president’s inaction has left it without much choice but to use the issue as a tool in increasing pressure on the DP.